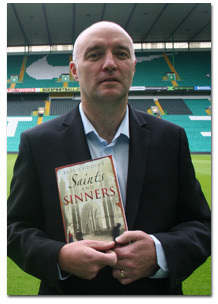 My first novel, Saints and Sinners, was published in June 2010 by Black & White Publishing which, as you’d expect, was a thrilling prospect. I’d waited almost forty-four years to achieve this ambition but it was worth the wait. These are not my words although I couldn’t have put it better myself. Saints and Sinners is told through the varying perspectives of the three main characters – a fugitive, a priest and a prostitute: two brothers and the woman they both love. It’s a compelling story of love and betrayal, obsession and faith – and the consequences of trying to run from the past. 24/06/2010 – Lights, Camera, Action! Saints and Sinners could be coming to the big screen after a London-based film company revealed they’re looking at the book.